A regal, grooved leg and clean rectangle shape allow our Seguso Modern Leg Table to work in any decor. Customize yours with your favorite wood and finish. 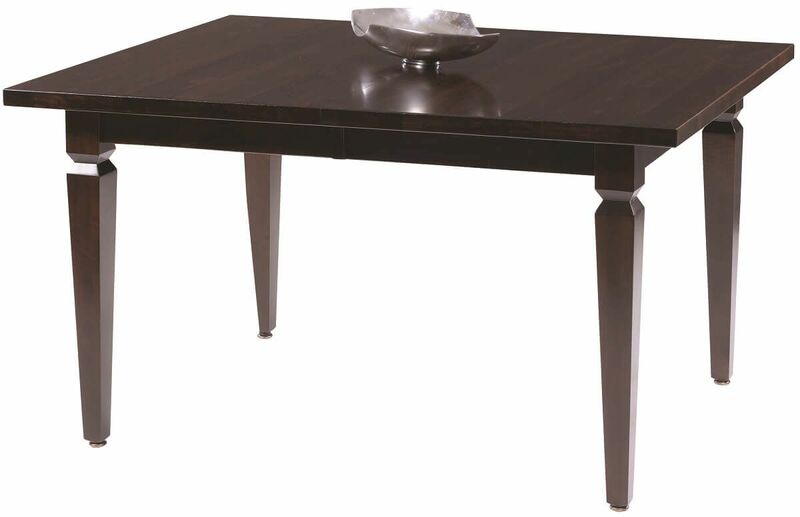 This beautiful Seguso Modern Leg Table features a unique, tapered leg design and solid hardwood construction. Offering a base size of 42" x 54", the Seguso includes an 18" self-storing extension leave with aprons. When entertaining, use the solid wood slides to insert the leaf and your table will extend to 72" in length. Design the perfect Seguso Modern Leg Table for your dining room, kitchen, or restaurant and Countryside will take care of the rest. If you prefer the Seguso Dining Collection as pictured, consider a smooth Brown Maple hardwood topped with our Winter Bark stain and catalyzed conversion varnish.